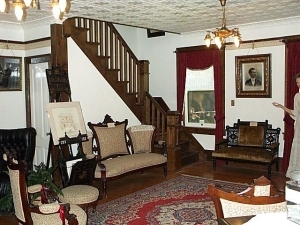 The main parlor was originally divided by a center stairway. In 1945, the stairs were changed to their present location along the wall. The replica tin ceiling typifies the ornate features so prevalent during the Victorian era. The maple floors were added after 1900, as were the built-in cabinets in the dining room and kitchen. The dining room pantry was built about 1880, with the kitchen pantry added to that about 1890. A bathroom built in 1912 has been entirely removed. Replastering of portions of the walls and stairway help preserve the original feeling of this modest family style home. The 1878 Variel Home is a handicap accessible building with a wheelchair entrance along the cement driveway. All ground floor doors are wide enough to accommodate wheelchairs.